This one hour walking tour is offered for those short on time or do not wish to walk long distances (tour is approximately one mile), but wish to see St. Louis #1 Cemetery, the oldest operating cemetery in New Orleans. 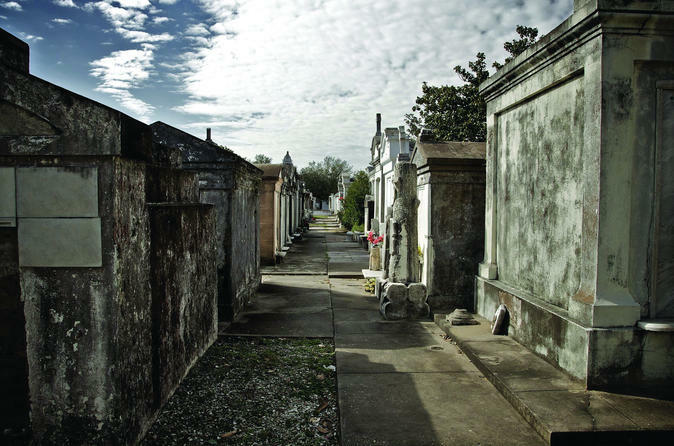 Your tour begins at 710 St. Louis St. in the French Quarter, with the history of the first burial grounds in New Orleans. A short walk to St. Louis #1 Cemetery, with your licensed tour guide, who will explain the details of our above ground burial practices, as well as how the oven vaults work as family or temporary burials. Included is the history of notables buried in a cemetery, made famous by the movie Easy Rider, the Protestant section, the Society tombs & the tomb of the Voodoo Priestess, Marie Laveau! You will spend approximately 45 minutes in the cemetery.